esa phase 2 inspection completed. it passed. report avail. commercial property. 2.6 ac and 600+ feet of highway frontage and 600+ directly on burnt river. high traffic location. great visibility. price includes buildings/land/fixtures. main building 2,600 sq ft. formerly kinmount timbrmart . many permitted uses. river water system and full septic. municipal water hook up possible. zoned general industrial (m2) zone in township of somerville zoning by-law. permitted uses start on pg 44 of the linked by-law. direct waterfront access to 4 kms of fishing & boating on the burnt river. muskie, pickerel & bass right from your own dock. why not live, work and play on the water in cottage country. 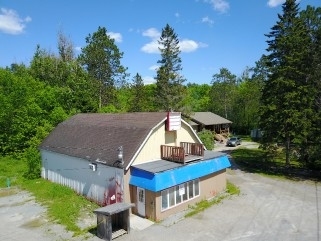 located in the quaint little village of kinmount, famous for the fair and the highland cinemas. in the heart of cottage country yet less than 2 hrs to gta. less than 30 minutes to minden, haliburton, bobcaygeon. adjacent to the rail trail. possible lease/vtb mortgage for qualified buyer.